After completing my BA in Fashion Design from London College of Fashion, I worked at Generation for about six years. I realized there was much more I needed to learn, especially the business of fashion, so I went onto pursue my Masters in Business Administration from Boston University. Iâ€™ve always loved design, and as Don Norman aptly said, attractive things work better. Coupling my design degree with a business degree allowed me to enhance both sides of the brain. Tell us about working with Generation and the journeyÂ that got you here. Generation was founded by my parents in 1983. As siblings, we grew up in the factory playing with threads, buttons and sandwiches made of fabric. Begum Aftab, the Stitching Head, taught me the Koran, and Gul Mohammad, the guard, was my soulmate. Generation has always been home. Now, it carries on as my two-year old son comes to work with me and we share the same office space. I decided to join Generation because of the importance of design and family. How would you describe your own sense of style and design aesthetic? It usually only takes me about five minutes to get dressed. I like to collect eclectic pieces from different parts of the world, and I have a special love for old pieces which imbibe the culture of a place, like a gorgeous Baagh or a multi-coloured Suzani jacket. There are also many items in my wardrobe that have been there for almost a decade. When something is really in fashion, then I wouldnâ€™t be caught dead wearing it. It is important to be unique and stand out. As far as my design aesthetic is concerned, I thrive on new ideas. It gives me an adrenaline rush to challenge norms. At the same time, I am very South Asian in my tastes. Everything is so much prettier if it is patterned, coloured or draped! I also prize material. Fabric especially has such a strange ability to capture so much emotion. Clothes, for me, become a celebration of fabric itself. What makes your collections stand out from the plethora of others in the market? I think I have been really true to who I am and what I love. If you do that, usually you end up creating something unique and individualistic. What was the theme behind your debut fashion week collection? My theme was to take a walk and absorb inspirations as I went along. I used pictures of my travels as my starting point. My inspiration board displayed rose gardens of Vienna, Mughal daggers from the British Museum, Egon Scheiles drawings of the naked human form from Prague, shadows of tree leaves on the human face from Lawrence Gardens and Japanese Sashiko textiles from the internet. Like a dot that went for a walk, each of these inspirations was developed and merged into the other to weave the story of the collection. How much time did you spend on its execution? Conception took a while. I used to come to work on the weekends when no one would be there so I could get time by myself and bring my thoughts and ideas together, but as work started flowing, the execution took about two months. What kind of response did you get from audiences? It resonated with people! The response has been overwhelming. Everyone I spoke with said they loved the collection, considered it very original and wanted to buy everything off the ramp. Many said they liked each and every piece, which is such a compliment! I didnâ€™t think people would say wow to plain cotton, but they did. Any memorable and/or disastrous moments whenÂ working on this collection? Is pret the new frontier? Naturally, as is in all evolving markets. 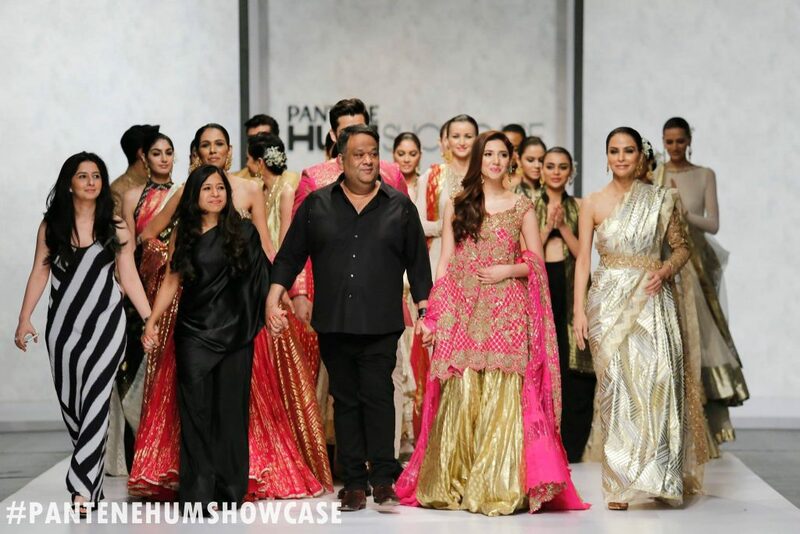 How would you describe the evolving world of fashion in Pakistan? Well the landscape is changing fast. Earlier, everyone and their khala was a fashion designer, but now the big fish seem to have become bigger and the playing field has shrunk. From one side the big textile mills have made their mark in the ready-to-wear sector and from the other side the designers have created their space. Then of course, there are the existing ready-to-wear brands in between both of these. All currently are quite busy fighting a price war, which I pray ends soon. Lawn brands are amongst the top three advertisers in Pakistan. Even the kind of digital marketing that fashion brands have is new and cutting edge and amongst the best in the country. Furthermore, the stores are the most well-designed and lush. We are part of interesting times. The textile industry is truly leading the market and making waves and it is thrilling to be part of it. In five years time, I expect to see more malls, bigger brands, more differentiation in product portfolios, large format stores and more European clothing. How can women in this generation be role models for future generations, or leaders? How do you think you have been, at home in your everyday life, and at work? Women have so much on their plate and for that reason I would measure success through how well a woman juggles all that she does. Others generally donâ€™t know how women actually achieve this balance, as it happens behind closed doors. Therefore, women often find role models in other women close to them who may possibly be from their family, as they are the only ones who get a chance to see how the other is able to achieve this magical act. I donâ€™t think Iâ€™m a role model or atleast thatâ€™s not how one views oneâ€™s own life. You try to do things to the best of your abilities so you can live a meaningful life, and becoming a role model is just a by-product. What decisions in your workplace have you taken that required the most amount of courage? I think perhaps being a mother and an executive in the same hours. Not that I could have had it any other way. So perhaps itâ€™s not courageous as such, but itâ€™s challenging. What are your future plans for the label? Be a thought leader in the international sphere. How do you balance work life with your personal life? I donâ€™t divide them. I mix them.